Q First things first: When and where is the race this year? 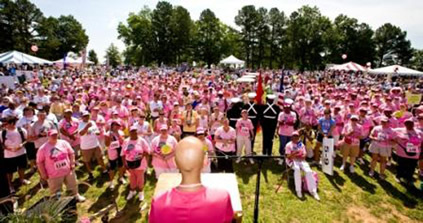 A The 15th annual Komen NC Triangle Race for the Cure is Saturday, June 11, at Meredith College in Raleigh. Q Tell us about your organization. A Susan G. Komen for the Cure is the nation’s largest private source of funding for breast cancer research and community outreach programs. A The Susan G. Komen for the Cure promise is to save lives and end breast cancer forever by empowering people, ensuring quality care for all and energizing science to find the cure. A The N.C. Triangle Affiliate of Susan G. Komen for the Cure — along with those who generously support us with their talent, time and resources — is working to better the lives of those facing breast cancer in our community. Through events like the Susan G. Komen NC Triangle Race for the Cure we’ve raised more than $12 million that has been awarded to North Carolina nonprofit institutions for breast cancer awareness, education, outreach, screening, preliminary treatment and research. A Nancy G. Brinker promised her dying sister, Susan G. Komen, she would do everything in her power to end breast cancer forever. In 1982, that promise became Susan G. Komen for the Cure and launched the global breast cancer movement. 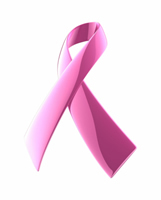 Today, Susan G. Komen for the Cure is the world’s largest grassroots network of breast cancer survivors and activists. Thanks to events like the Susan G. Komen Race for the Cure, we have invested more than $1.9 billion to fulfill our promise. A Imagine life without breast cancer — where your mother, daughter, sister or friend doesn’t have to worry if she will be the one-in-eight women diagnosed with the disease. While we have made tremendous progress in the fight, breast cancer is still killing and impacting far too many of our loved ones. You may be a runner. A volunteer. Or an activist. However you choose to get involved, everything you do makes a difference. Without the support of people like you, we know 10 million people could die of breast cancer in the next 25 years. Q In addition to participating in the race, how can Triangle women get on board? A By making a donation today, you can help save lives. Visit our website for more information: www.komennctriangle.org. The 16 artists who received Ella Fountain Pratt Emerging Artists Grants were honored at the annual awards ceremony and dinner at the Durham Arts Council. Durham County winners included: Monica Byrne, literature; Jody Cassell, dance; Jennifer Collins-Mancour, craft; Julia Claire Gartrell, installation; Heather Gordon, visual art; Shanna Jackson, photography; Shannon Morrow, music and Chaunesti Webb, drama. Orange County winners include Ellen Hemphill, drama and Killian Manning, dance. Chatham County winners include Anna Lena Phillips, literature and Lizzy Ross, music. The Emerging Artists Grant Program enables those who have mastered their art form to complete projects that will establish or enhance their professional careers. The Durham Arts Council coordinates this program in partnership with the arts agencies of adjacent Chatham, Orange, Granville and Person counties. Sheri Castle, a food writer who lives in Chapel Hill, saw her book “The New Southern Garden Cookbook: Enjoying the Best From Homegrown Gardens, Farmers' Markets, Roadside Stands, and CSA Farm Boxes” published by UNC Press. It offers more than 300 brightly favored recipes that are intended to inspire beginner and experienced cooks, Southern and otherwise, to take advantage of seasonal food. Elizabeth Woodman, of the nonprofit Eno Publishers in Hillsborough, announced that “27 Views of Hillsborough,” an anthology of work by the town's writers, won top honors in the Independent Publishers Book Awards. The book received the Gold IPPY Award for Best Anthology. Subtitled “A Southern Town in Prose & Poetry,” the book includes essays and fiction by 27 writers who live in Hillsborough, including Jill McCorkle and Lee Smith. Eno Publishers is dedicated to publishing books about the culture and history of the Carolinas and the South. Andrea Reusing, owner of Chapel Hill’s Lantern restaurant, is the author of “Cooking in the Moment: A Year of Seasonal Recipes,” which was published by Clarkson Potter. A leader in the sustainable agriculture movement, Reusing is an advocate of “cooking in the moment" which simply means focusing on one meal at a time. The book is a journey through a year in Reusing's home kitchen as she cooks for family and friends using ingredients grown nearby. Reusing is a finalist for the James Beard Foundation best chef in the southeast for 2011. Anna Jean Mayhew, a 71-year-old resident of Hillsborough, wrote her first book, “Dry Glass of August,” which was published by Kensington Books. Her novel about Southern life in the throes of segregation is set in Charlotte. Mayhew is a writer-in-residence at the Weymouth Center for the Arts & Humanities and is a former member of the board of trustees of the N.C. Writers' Network. Kala Ambrose is the author of a new book, “Ghosthunting North Carolina,” which will be published in September by Clerisy Press. The book is meant to be enjoyed by relatives and friends who pile in a car to see historic haunted sites and learn about the history of the state. Susan Ward, of Raleigh, a philanthropist and retired artist, was appointed to the N.C. State University board of trustees while Barbara Mulkey, founder and chairman of the board of Raleigh-based Mulkey Engineers and Consultants, was reappointed to the 13-member board. Marie Davidian, Ph.D., William Neal Reynolds professor of statistics at N.C. State University, was elected president of the American Statistical Association. Her term of service will begin Jan. 1, 2013. The ASA is a scientific and educational society with members serving in academia, government and industry in more than 90 countries. Stacy Griffin, human resources director for Randolph County, received the Edwin M. Gill Award for her performance during the 2010-2011 county administration course. The award is given by the N.C. Association of County Commissioners. Julie Anderson, assistant town manager and director of finance and administration for Pine Knoll Shores, received the George C. Franklin Award for her distinguished record in the 2010-2011 municipal administration course. The N.C. League of Municipalities presents the award. Barbara K. Cleary celebrated her 10th anniversary serving as a writer in residence in Triangle schools through the United Arts Council’s Artists in the Schools program. Also, Cleary celebrated the first anniversary of her education blog, which can be accessed at http://attentionologyforteachers.wordpress.com. Kendra O’Neal-Williams is principal of the Clement Early College High School, which earned the 2010 School of Distinction honor awarded by the State Board of Education under the state's ABCs of Public Education accountability model. The school is located on the campus of N.C. Central University in Durham. Kristen McGhee, co-owner of Brooke & Birdie Interior Design in Raleigh, met with Lillian August in High Point to discuss her new line of furniture and fabrics made by Hickory White. Allison Witt joined the Sheraton Chapel Hill as director of group sales. Krista Davila, of Raleigh, brought Floor Coverings International, a shop-at-home retailer offering more than 3,000 flooring options, including carpet, hardwood, laminates, vinyl, tile and rugs, to Raleigh, Durham, Chapel Hill and Wake Forest. Peggy and David Mackowski, owners of Quality Design & Construction, based in Raleigh, were recognized in the April issue of Remodeling, a trade magazine, for their online Aging-In-Place checklist. Quality Design & Construction is a design/build general contracting firm specializing in residential remodeling. Kim Perkins, of Raleigh’s Innovative Talent Solutions, a staffing firm, said it recently received its fourth Pinnacle Award from the Greater Raleigh Chamber of Commerce. Medina Blanton was named the account manager for the benefits consulting department of the Jacksonville, N.C. branch office of SIA Group, an insurance agency based in Raleigh. The Umstead Hotel and Spa in Cary, founded by Ann Goodnight, partnered with EcoStyle and Clean the World Foundation to further its sustainable initiatives. EcoStyle provides guests with environmentally friendly transportation service while Clean the World distributes leftover soap and shampoo products to countries in need. Leah Brown, president and CEO, received the Minority Business Enterprise Excellence Award at the executive networking conference of the N.C. Institute of Minority Economic Development. Dawn Duggan joined the firm as director of strategic clinical solutions. Duggan is responsible for growing A10’s presence within the northeastern U.S. pharmaceutical and biotechnology hub. Heather Freeman joined ATCOM Business Technology Solutions, a Raleigh-based communications solutions provider, as project manager. Rella:Cowan, a marketing and advertising firm based in Durham, received an award for best of category from PICA, the Printing Industry of the Carolinas, at its 44th annual awards competition. Margaret Cowan is a partner and general manager of the firm. In recognition of her accomplishments as one of the state’s top minority business leaders, she received a scholarship from the Carolinas Minority Supplier Development Council to the week-long Tuck Executive Education program at Dartmouth. The firm received the 2011 Pinnacle Steady Growth and Profitability Award from the Greater Raleigh Chamber of Commerce. Christine McCallum joined the firm as a project manager. Christina Motley, an account manager, received several awards at the 2011 Virginia Press Women Communications Contest. Among her awards, Motley won first place in individual achievement for the first strategic marketing plan for Piedmont Access to Health Services and first place for a three-part blog series written for Handshake 2.0, a division of Handshake Media. Motley has been a member of Virginia Press Women since 1990; she joined the North Carolina Press Club when she moved to Raleigh in January. * Elizabeth Romero was promoted to management supervisor. * Mariana Pinner joined the public relations team as a senior account supervisor. Scheryl McDavid, a marketing communications and brand messaging professional for engineering, manufacturing and consumer organizations, joined Burkhead Brand Group, of Cary, to complement its public relations capability. Patty Briguglio, president of Raleigh-based MMI Public Relations, announced that her firm won the Pinnacle Business Steady Growth and Profitability Master Award from the Greater Raleigh Chamber of Commerce. Patricia Valentine, president of the Progressive Sertoma Club, presented the “SERvice TO MAnkind” Humanitarian Award to Gail Mills and her husband, Dr. Ernie Mills, who co-founded the Durham Rescue Mission. Marjorie Menestres, executive director of SAFEchild, a nonprofit child-abuse-prevention agency in Wake County, announced that Lisa Duke received SAFEchild’s Commitment Award. The honor recognizes exceptional devotion to the SAFEchild mission of eliminating child abuse in Wake County by helping adults and children create nurturing environments free from abuse and neglect. Duke served on the SAFEchild board of directors from 2000 to 2009. Tiffany Drummond Armstrong, executive director of the N.C. chapter of the Leukemia & Lymphoma Society, announced that Cynthia Brodhead, an attorney who serves on many nonprofit boards and is the spouse of Duke University’s president, is the walk chair for the group’s 2011 Light the Night Walks in the Triangle. The events, which are held each fall, raise money for cancer research and patient services. Crystal Suazo, partner, and Beth Shandley, senior financial recruiter, teamed up to launch the Raleigh chapter of the American Society of Women Accountants. The group represents professional women in accounting and finance and provides an opportunity for networking and continuing professional education with peers at the local, regional and national level. Andrea Wun was appointed a member of the board of directors for the Research Triangle Park chapter of Women in Technology International, a leading trade organization connecting women with careers in business and technology. The nominating committee of the Cary Chamber of Commerce selected candidates for its board of directors, including Carrie Cassidy of the Umstead Hotel & Spa and Becca Smith of Robert G. Smith, CPA. Dale Pennington is the new executive director of the Orange County Historical Museum in Hillsborough. Trish Rafalow, director of the ReSale Store for Paws4Ever, in Hillsborough, announced the success of its Adopt-a-Thon series on the first Saturday of each month. All the profits from the store, which runs on a volunteer model with donated items from dog beds to saxophones, go to Paws4Ever, a no-kill animal shelter. Communications, membership director; Allison Perkins, of Reclaim Professional Organizing, professional director; Jill Hively, of Order Up Organizing, communications director; and Lori Bruhns, of Everyday Tidy, immediate past president. Nancy Pierce, a certified meeting planner, is working with the Chapel Hill/Orange County Visitors Bureau to assist with its sales efforts during the summer months. Jennifer Dunleavy, president of Accuro, a staffing and recruitment firm, was named to sit on the Membership Services and Small Business Committee of the Greater Raleigh Chamber of Commerce. Dottie Burch, an equine law expert and partner at Ragsdale Liggett in Raleigh, was appointed to serve on the executive committee of the N.C. Horse Council. The executive committee is the business management arm of the nonprofit council, which represents the interests of the equine industry throughout the state. Burch serves on its board of directors as well. Margaret King was promoted to practice administrator at Wake Radiology. In her new role, King will lead Wake Radiology in all areas of business development and operations management. The practice serves the Triangle with 55 board-certified radiologists in 17 locations. Cindy Alness Boily, RN, MSN, was welcomed to the position of senior vice president and chief nursing officer at WakeMed, based in Raleigh. Most recently, Boily served as chief nursing officer for Broward General Medical Center, a 716-bed hospital in Fort Lauderdale, Fla.
Quiana Childress, who went from being homeless in rural Arkansas to graduating from college and pursuing her dream of becoming a doctor, is working as a research fellow at the National Institute of Environmental Health Sciences in Research Triangle Park. A recent graduate of the University of Arkansas at Pine Bluff, Childress has applied to medical school and is anxiously awaiting acceptance. First lady Michelle Obama, the Arkansas commencement speaker last year, singled out Childress as an example of triumph over adversity. When Childress was only 16 years old, she became homeless and lived out of a car as she struggled to finish high school while working two jobs.